So I was browsing my local nursery when I saw this ficus available for really cheap. I decided to give it a try, so I took it home. After cleaning off the roots and re-potting it, I wasn't really sure what to do with it. It's been about four weeks since re-potting, and only the lower leaves have dropped. Currently the tree is approximately 2 feet tall from the rim of the pot and I'd like to shorten the tree to about 1 foot total, but the lack of lower branches makes me worried. I think the ficus is still too young and too early to be styled, let it grow first. then if you managed to at least double the size of trunk, you can consider cutting it short to create a compact looking ficus. I know I'm going to make someone mad here, but . . . why buy a tree -- cheap or not -- when you can't see a bonsai in it and have to ask "what to do" here? Other bonsai sites are much worse, but I see too many plants pictured here that just have no bonsai potential. You don't want to say that (though I often do), so sometimes we give convoluted suggestions -- air layer, trunk chop, let it grow (and hope), etc. -- rather than say "take it back." You do not have to buy anything when you visit a nursery. If you don't see something that screams "BONSAI" at you after you've poked under the soil for roots, or peered into the foliage for the trunk line or suitable branch placement, leave the danged thing on the shelf. I totally agree with Jim here. There are a huge selection and variety of trees posted here on a daily basis and most of them exhibit the good qualities necessary for good bonsai. More time spent observing what others consider good material and your on your way. JimLewis wrote: I know I'm going to make someone mad here, but . . . why buy a tree -- cheap or not -- when you can't see a bonsai in it and have to ask "what to do" here? I know I don't have to reply on this Jim. but this reply is not for you but for others new to the hobby. maybe, I am still young and new to bonsai (compared to most people around here),,,so may point is, the feeling of being a beginner is still very fresh in my mind and heart as well, so I can still relate and understand the mind set of the newcomers, and I think sometimes, people new to the hobby can't distinguish the good material from the not so good or something even worse. and I think it is just right to ask from somebody who you think can give any sort of help or advice. and it is always good to buy cheap material in the beginning rather than spend on expensive materials without the basic knowledge on what to do with it. Actually, I think if he (the buyer of cheap material) can learn a thing or two from a 5 dollar worth of material he can already recover the cost of his expenses...for example, if you could observe the growth pattern of the small cheap tree on your local (zone) for the different seasons or how would the specie will react to different fertilizer, or would it snap if wired, and some few more things involving basic bonsai growing. Then after that, even if you kill the tree intentionally...it already served its purpose. So I think asking question, No matter how insignificant it may sound to the "experts" around here is always a good thing...that's the essence of this forum...I think. ...but you and Rex are right if we are looking at the perspective of achieving something competitive for this tree. it will be difficult and would be a very long journey...but something else can be achieved even with the ugliest thing around. the important thing for a beginner is gaining knowledge first before stepping further into the experts world. This is my personal thought on this, and nothing against anybody. I agree and recommend people practice their technique on cheap material, rather than more expensive stuff Jun. Thats exactly how I learned and I would trawl garden centre bargain areas for such material. I think Jim is on about the lack of vision with this tree. If I spent £5.00 on a tree, I had an idea of what I was going to do with it and though that may have changed as I worked it, I could see a tree in my minds eye. In response to jim and will I had selected this tree because of the interesting trunk line that I thought had some character to it, and having minimal room to grow bonsai as I would like (you can probably tell that the first pictures are from my apartment balcony) I felt it was best to try something with a slight amount of character, than to spend $70 or more on the nurseries pre-trained bonsai, or trying to field grow my own bonsai with what limited space I have available. Maybe the real question is this; after transplanting this ficus, all the leaves of the lower branches fell off, leaving the already-too-tall canopy above. Having minimal experience in ficus (and really any other growing plants for that matter) I decided to ask some pros about what could be done. Having lurked around this forum for some time now, I realized that there was a large amount of experience and it's always nice to get some objective opinions. So what could be done with this ficus to promote lower leaf growth without totally chopping the top half of the tree? It's not that I think this tree is devoid of any bonsai potential and i'm searching for it's purpose, I think the tree would make a great bonsai, but I lack the experience to direct growth to the lower areas of the tree. If you can keep it very humid and give it lots of light, it may backbud. Aquariums are great to hold humidity and heat. This reminds me of an old Jewish joke. Jim and Jun are both right, and brycebertola is right, too. You will need to put the tree outside for the summer, gradually in full sun. Your dry climate may be a limitation, but the sun will make up for it. Feed & water like mad. By the way, your tree is Ficus microcarpa, Chinese banyan, a tough customer. I have a tiger bark fig, the same species, with exactly the same problem. Right now it is under fluorescent lights with the upper branches jammed up against the tubes, & the naked lower trunk mocking me. I tried shortening the branches earlier, but it did not result in back budding. I am letting it grow. My plan is to wait until it is time to put Ficus outdoors, when night temperatures get up around 45 F (7.2 C). Here in Zone 5, that will be late April or early May. At that time I will do a trunk chop somewhere above the lowest branch and let nature take its course. I also have a Ficus benjamina I am experimenting on, that will get similar treatment. If you can put it under fluorescent light in the meantime, that will help. It will do no harm to shorten the topmost branches a little. Don't cut off the leafless branches until you are sure they are dead. And be wary of advice from the tropics, including Florida. It has nothing to do with growing Ficus in the North. you kill the tree intentionally...it already served its purpose. Yeah, I've heard that before. But the fact remains if you do not find a tree that screams BONSAI at you, you should not buy it. And if you are new to the art, you shouldn't rush to the nursery the moment after you decide that bonsai "might be fun" because you will have no idea what you are looking for. I'm not pointing a finger at anyone here -- well, maybe at the guy who has exchanged a couple of PMs with me in the past on this topic. I AM saying that you should have an idea in your head about what you want in a bonsai before you go to a nursery. 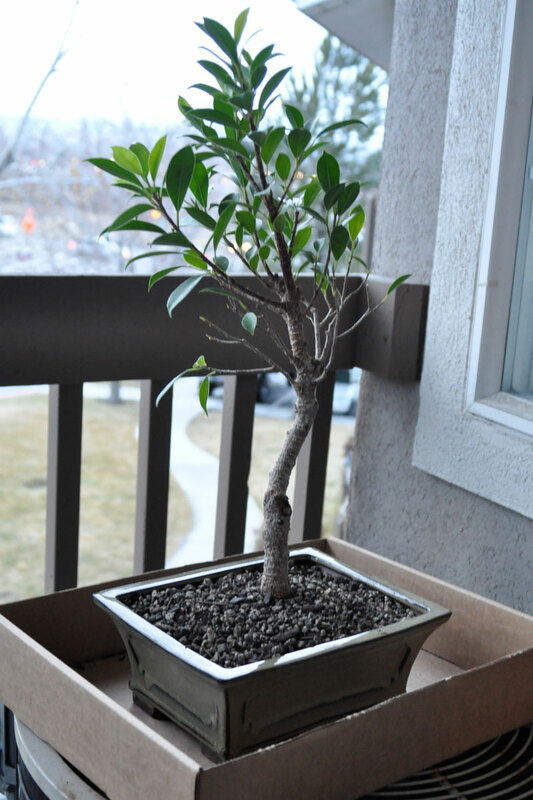 To do that, you look at bonsai -- GOOD bonsai -- like those you will find on our Bonsai Forum. You study them and decide what makes them a good bonsai (and -- later on perhaps -- what would make them a better bonsai in YOUR eyes). Your next step should be the library or a bookstore so you can read something about what it takes to keep a bonsai alive and healthy -- not to mention styled so it looks like a tree. Most beginner's books have at least something in them about selecting trees from a nursery. You should also shop around for a local bonsai club. In the USA, www.absbonsai.org is where you can find clubs in your area. Join. Look at their trees -- in 3 dimensions, not the 2-D pictures you see here. But even after you've looked at trees on this site, gotten a book, and at least visited a club you're really still not ready. The first thing you need to be able to do is keep a plant alive. Have you ever grown anything? Maybe a radish in a school garden? Or better yet a house plant? If you haven't, you will not be able to keep a bonsai healthy. So there's lots to learn before a newcomer should go out and find a tree to kill. Personally, aside from maybe learning whether you can keep a plant alive indoors, as here -- and it is MUCH, MUCH harder to keep a tree alive indoors than out in the yard on a table -- I can't imagine that you will actually learn anything about bonsai from a $5 tree of any species. Aside, perhaps, how easy it is to get frustrated and confused when your tree doesn't look like a Kimura masterpiece after a week or two. The hardest skill to learn in bonsai is patience. Well, according to Brycebertola, the tree may not have shouted bonsai at him, but it whispered something to that effect. To me, the big problem is not lack of lower branches; that can be corrected. The trunk has no taper. You will not be able to correct this. Meanwhile, as you surmised, practice on it. I have a couple of questions. Where are you keeping the tree now? If it is not in a very sunny south facing window, you must put it under a fluorescent lamp, like a shop-light. Do you have any other bonsai? Have you found a club in the Salt Lake City area yet? Have you read any bonsai books? I disagree that you can't learn anything in bonsai with a 5$ tree. I started my bonsai in a 3$ tree (150.00pesos). and I can personally attest that I have learned lot of things very related to bonsai from that tree. it's a cutting of chinese banyan, and I learned the things that I posted above from that tiny ugly tree. the tree right now is still planted in the ground for some time now and used a cutting from it recently that I am now fusing to a rock ( I will post later the picture of the small mother tree and it's "child" tree.). We don't have library with bonsai books here and virtually no bonsai books being sold in bookstores, so I must learn from hands on experience. Though, I have a handful of trees right now that ugly 3$ ficus is still one of my favorite. I think, it's like owning your first car. In most cases its the cheapest you can afford but the one you won't forget the most. So, I hope new comers to the hobby, won't be dissuaded from venturing into bonsai because starting it is not like buying an expensive bonsai kit for beginners. You can even start bonsai for free. Though, not every material can be turned to a masterpiece worthy of Kokufu ten, surely every tree can be turn into bonsai looking tree, just don't forced it yet until you got the sufficient knowledge on how to do it. To me Bryc's ficus looks alright as a starter tree. What I'll do is plant it in an over size pot or on the ground (if you can) for a couple of years. Wait till the main trunk become thicker before start training it as a bonsai. Alas, the perils of an international forum. No, he can't plant a Ficus in the ground in Salt Lake City (except for the summer). Potting in an oversize pot may not be necessary. I have a Green Island fig, also F. microcarpa, that fell on evil days and most of the top died. (See Bald Ficus.) Now that it is recovering, it has back-budded all the way down to the soil line. Come May, chop off the top part of your tree and it should give you branches lower down. And in the future, please don't repot tropicals in February, except in an emergency. I have found that it is not smart, even with my controlled plant room. PS Salt Lake City, Utah is in USDA Zone 6b. That's warmer than Central NY, about the same as southern New Jersey, but dryer. bonsaisr wrote: Alas, the perils of an international forum. No, he can't plant a Ficus in the ground in Salt Lake City (except for the summer). Potting in an oversize pot may not be necessary. Sorry, I had not taken the consideration of climate difference. I am so used to hot climate over here which ficus grow very well on ground. JimLewis wrote: Yeah, I've heard that before. But the fact remains if you do not find a tree that screams BONSAI at you, you should not buy it. And if you are new to the art, you shouldn't rush to the nursery the moment after you decide that bonsai "might be fun" because you will have no idea what you are looking for. Hey Jim, Thanks for the advice. I have been studying up for some time now, but as you mentioned this particular plant was more of an impulse purchase than a well thought out investment. It didn't scream bonsai, but it did have a few distinct elements that caught my eye. I am still new to bonsai, but I have done my share of studying and admiring, particularly on this forum. After reading some comments and evaluating the tree some more, I decided to cut back some of the main shoots by a few inches each. I also wrapped a few of the lower branches in plastic bags with a squirt of water to increase the humidity. Hopefully this will force more growth underneath. In the future I may attempt a graft at the first bend in the trunk, this would introduce more taper and allow me to lower the overall height of the tree. Keeping up high humidity and plenty of light is essential for growth on most ficus species and will aid in promoting back budding(which has already been stated).Low humidity will cause slower and weaker growth. I have found that using a clear plastic storage bin is a great way to create a humidity chamber/ mini greenhouse. I just turn it upside down. This keeps the humidity high during the cooler months of the year when the tree is indoors. Find one in a size that fits your needs and it shouldn't be more than $10. Ryan has mentioned using a fish tank which works as well but is much more expensive if you don't already have one. Good luck. Regarding the prospect of growing Ficus in the ground, F. microcarpa is naturalized in Florida, Hawai'i, and Puerto Rico. It undoubtedly has been planted in the ground in southern California, southernmost Texas, and some of our tropical possessions, but didn't bring its wasp along.